Barcelona beat Real Betis 4-1 in the LaLiga, thanks to a hat-trick from Lionel Messi and one goal from Luis Suarez. For Real Betis, the only goal was scored by Loren Moron. The first half started with Betis keeping the possession of the ball very well and creating a few chances, which came to nothing in the end. Then Barcelona got a free kick on the edge of the box which Messi curled it beautifully around the wall and into the back of the net to give Barca the lead. In the dying moments of the first half, Messi doubled Barcelona's advantage. 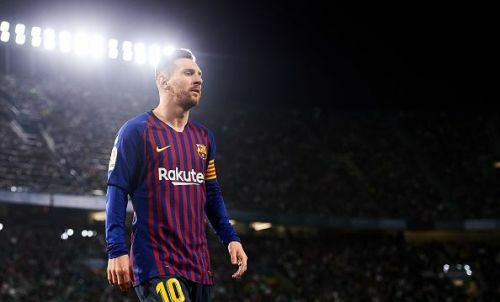 Luis Suarez drew all the Betis defenders towards him and found Messi, who toe-poked it past the keeper and the Blaugrana went into a comfortable 2-0 lead at half-time. The second half saw Betis miss an early chance as Sergio Canales missed an opportunity. Suarez made it 3-0 on the night for Barcelona after he made a brilliant run, passing three defenders and slotting it into the back of the net. Real Betis got one back around the 82th-minute mark through Moron after he was found by Diego Lainez. Barcelona then made it four and it was Messi who scored the goal to complete his hat-trick. The goal was an absolute peach by the little Argentine and could also be the goal of the season. Rakitic found Messi at the edge of the box and the Argentine chipped the ball from outside the box, over the keeper and into the back of the net. Betis had more of the ball in the last few minutes but the Blaugrana won the game quite comfortably.